I made this for a friend's husband who likes the seaside. 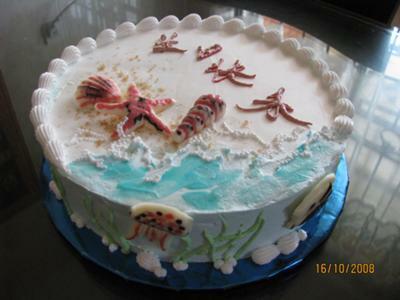 The shells and the fishes are mould from chocolate. I frosted a section of the top to create the water. I added some blue piping gel and pumped small dots of fresh cream to make the water wave. Hi Kelly, I used chocolate mould may be can use for candy too. Most of my cake I used fresh cream as it taste better and not so oil. On top of the blue fresh cream I added a random thin layer of darker blue piping gel so to make the wave looks real. Did you use a candy mold? What a great idea. You have a terrific imagination and can make it come to life on a cake! !